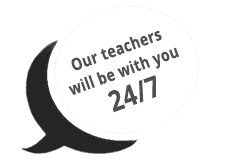 You have successfully signed up for Free trial Norwegian language course. You need to activate your account before you can start using the site. You will receive an e-mail with instructions within a few minutes. Some people have trouble receiving our e-mails because automated messages often end up in spam folders or blocked by ISP’s. In such case please contact us. This Free Trial will let you discover just how effective the Lingua Sunrise system really is! 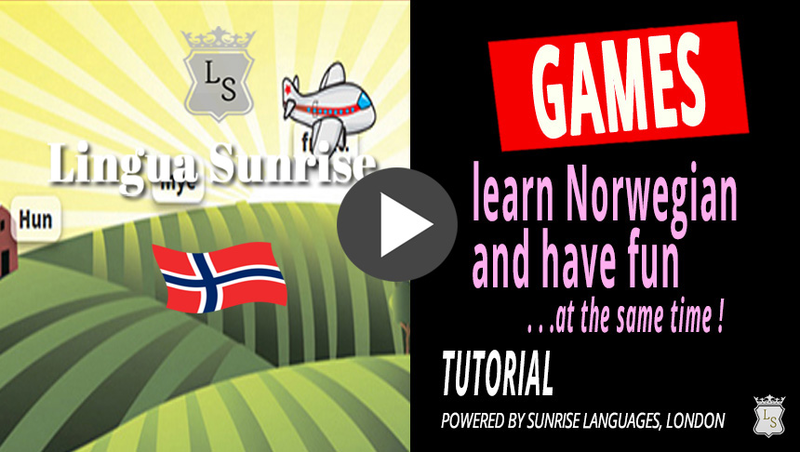 You'll be speaking Norwegian confidently right from the very first lesson! and having fun while you're at it! Sign up and start your 6-day free trial! Norwegian is one of the easiest languages to learn. It’s perfect for learning online. You don’t need to spend a fortune on attending a language school. You don’t need to buy any books, either. You don’t even need a pen. We’ve got all learning materials for you, just one click away. Why not have fun while learning? You will find tons of written and recorded examples that will help you learn Norwegian. Your browser is outdated, unsecure and does not support the video element. 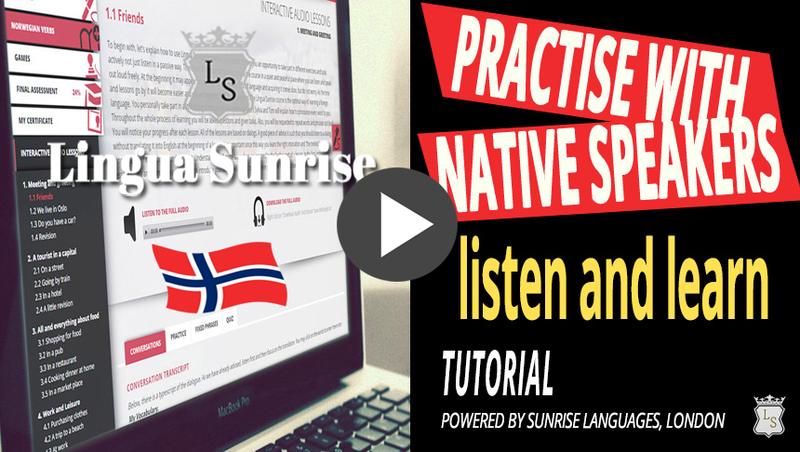 You can practise your pronunciation listening to many sentences recorded by native speakers of Norwegian. 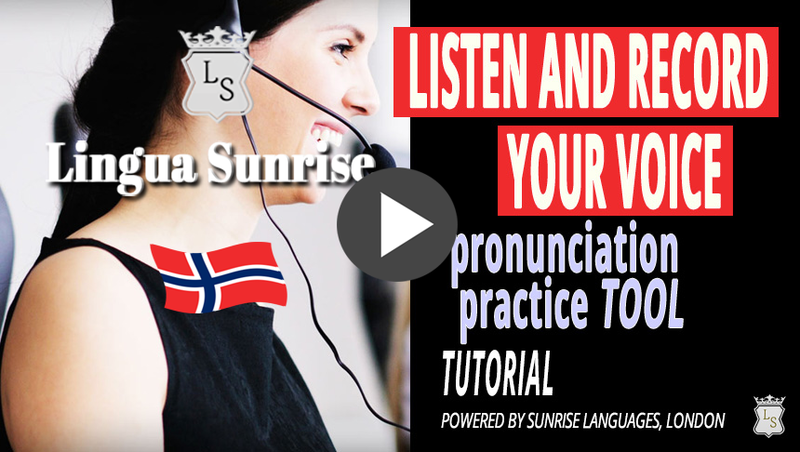 This gives you a great opportunity to learn new Norwegian words together with their correct pronunciation. You can join in every dialogue – all you have to do is stop one of the speakers and play their part, reading out their phrases and sentences. You can manage the conversations and hold them the way you want. 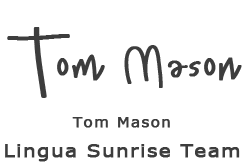 Hear It Say It – our pronunciation practice tool – allows you to listen to utterances pronounced by native speakers as well as to record your own pronunciation of the same phrases and sentences and compare it to that of the native speakers. Comprehensive descriptions of grammar are illustrated with numerous examples which you can also listen to. Every grammatical construction used in the dialogues is explained. Ask your questions to our team of native language teachers. They will answer all your language questions and be with you every step of the way. Meet other Lingua Sunrise students and fellow language enthusiasts both beginners and those who have already completed several parts of the course. We have prepared hundreds of exercises to allow you to check your progress after each lesson. 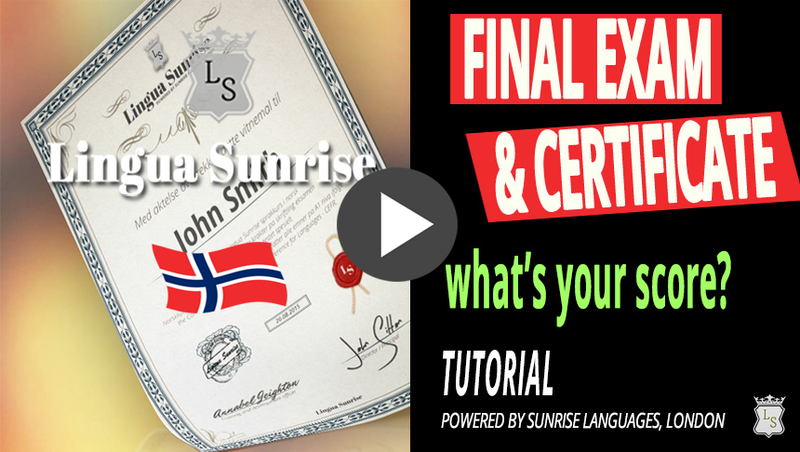 When you have completed the whole course, take the final exam and print out your certificate in English, Spanish and in Norwegian. The web page has been built in a very interesting way. It is a real knowledge compendium presented in a way which is easy to acquire. As it is easy to use it is a great encouragement to keep up learning every day. Extras such as games actually change the prices of learning into pleasure. I really recommend it to anyone who wants to learn Norwegian. To be perfectly honest I have to admit I’m impressed. There are lots of vocabulary items here as well as quite clear grammar explanation. You can create your own dictionary and add there words which you consider to be useful or necessary.It’s a perfect course, indeed – the topics are clear and well grouped – interactive audio lessons, vocabulary, dialogues. Brilliant. I do not give my opinion in forum too often but this course deserves a sincere recommendation. Hello! I am extremely happy from using Lingua Sunrise. Such form of learning fits me a lot – I can contact teachers and other students in English any time something seems to be difficult for me. I’m glad such a learning platform for Norwegian has been created. I’ll gladly recommend the course to my friends. Greetings. 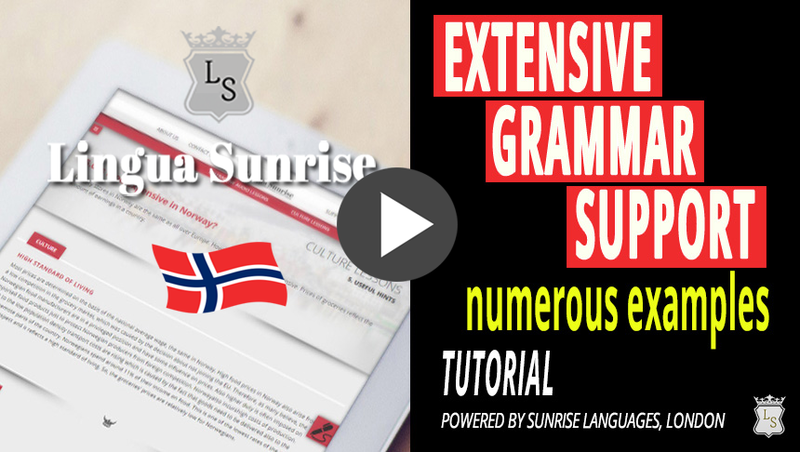 I have used a number of books to learn Norwegian, but now I see that I could have saved lots of money if I had discovered Lingua Sunrise earlier. This course offers very clear explanations of many areas of grammar, with lots of useful examples – I get to understand something new every day, like: “Ah! It’s all clear to me now”. 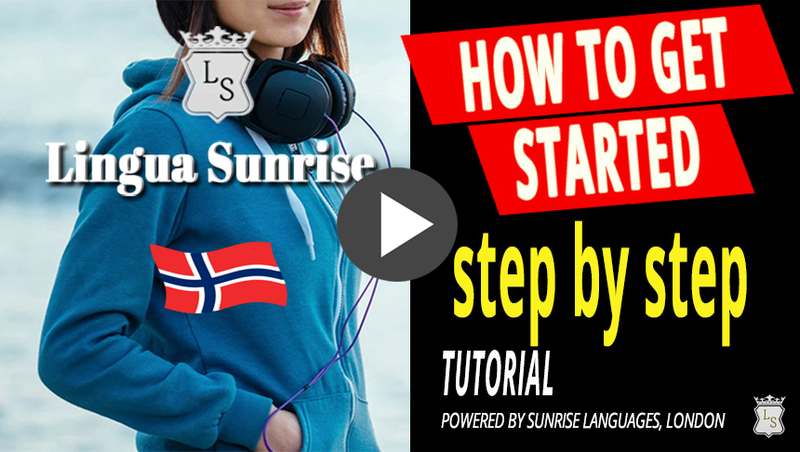 I would recommend Lingua Sunrise to everyone who wants to learn Norwegian as quickly as possible, because this course is very easy to use, and it really gives great results. And it is also fun at the same time. Lingua Sunrise gives me motivation needed to learn the language and I can’t wait to see the next level when they release it! (And I hope they will). The course is very well structured, easy and fun to use. The option of listening to the correct pronunciation of words and sentences convinced me it was the best choice. 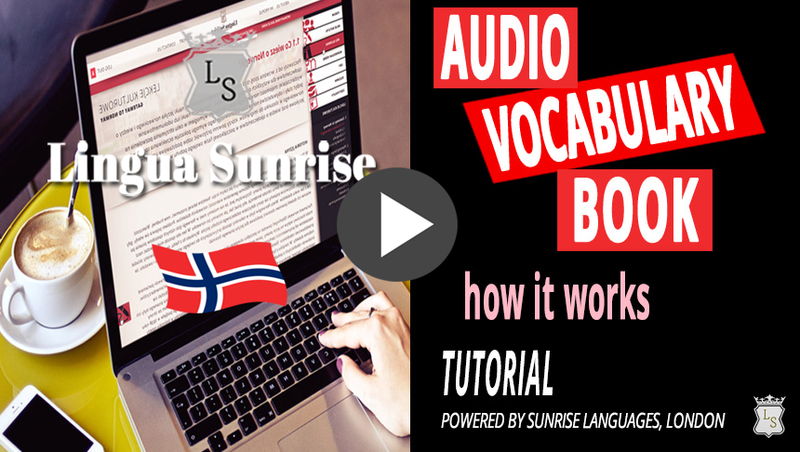 Lingua Sunrise has all the elements of perfect language learning software. It was amazing that I could play an active part in the lessons and dialogues – it’s a technology I have never seen anywhere else. Sunrise audio recorder recommended browsers: Chrome, Firefox and Opera. You may need to turn up the volume on your computer. 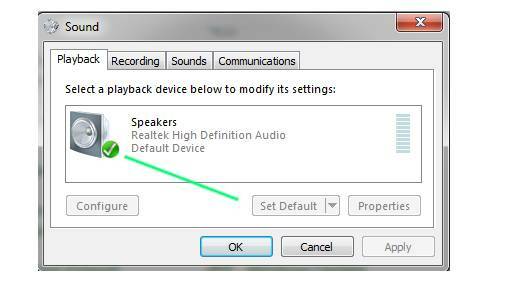 Then check if Speakers are set as Default. If not, double click and Use device. 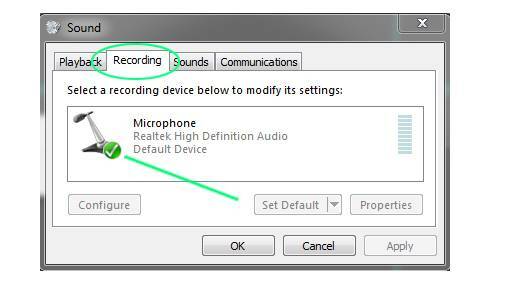 Then check if Microphone is set as Default. If not, double click and Use device. in System Preferences go to Sound and adjust your Output Volume. Why do I need to line up my audio with the tutor’s audio? To get the most out of Sunrise Record, we recommend that you try to match the timing of the audio as closely as possible. If the timing is out slightly you can drag your recording to the left or right to try and get a closer match. Then you can play both audio tracks at the same time by clicking on the red play button on the right hand side of the recording area. This way it will be easier for you to tell if your accent and pronunciation is close to the native speakers or not. to acquire a headset with a microphone.